This month’s SEA Days continues our Shark Summer theme by highlighting the importance of shark research to developing, shaping, and improving fishery policies. 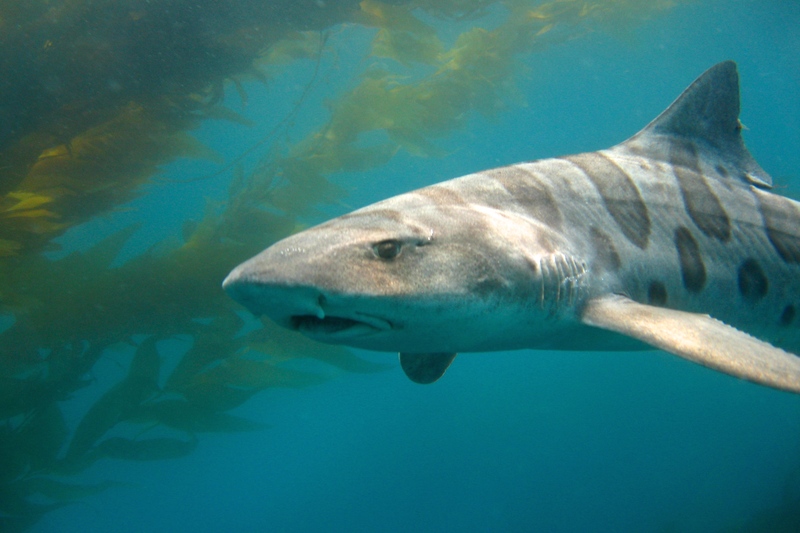 Fisheries affect sharks globally, as well as sharks living in Southern Californian waters. A diverse array of sharks live off our local coast due to the Southern California Bight (SCB). The SCB is the coastal and offshore area between Point Conception and south of the US-Mexico border, looks like something actually took a bite out of California, and has many different types of sharks living in it because it has habitat diversity. Habitats such as eelgrass beds, kelp forests and open ocean can support swell sharks, leopard sharks, thresher, blue, mako sharks…and more! The unique ecosystem of the SCB is an important topic to study, and Dovi Kacev is doing just that. 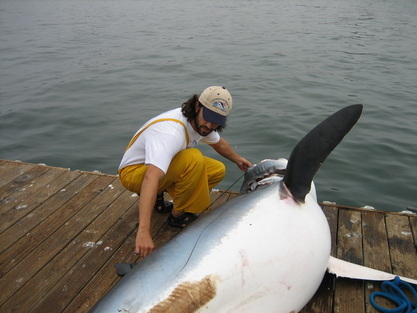 Dovi is a Ph.D. candidate at San Diego State University conducting research on mako and thresher sharks found in the Southern California Bight. He has extensive experience with sharks, including working in a lab at Scripps Oceanography. Now, his research consists of using molecular techniques to analyze the local populations of pelagic sharks, mainly makos and threshers. This research can contribute to scientists’ understanding about population structure and ultimately how these sharks use their habitats. In turn, this research can also contribute to creating marine protected areas and sustainable fisheries. Below, Dovi answers questions about his experience with sharks and gives advice for future scientists. Dovi measuring a large short fin mako shark caught by a recreational fisherman. Photo courtesy of Dovi Kacev. My undergraduate education was at UCLA and my Ph.D. is in progress in the Joint Doctorate Program in Ecology between SDSU and UC Davis. I like to consider myself a conservation ecologist. My current research uses genetic tools to better understand populations of difficult to observe, pelagic sharks. Genetics are a powerful tool that allows us glimpses into the private lives of sharks. Ever since I can remember, the ocean and the creatures within it have fascinated me. 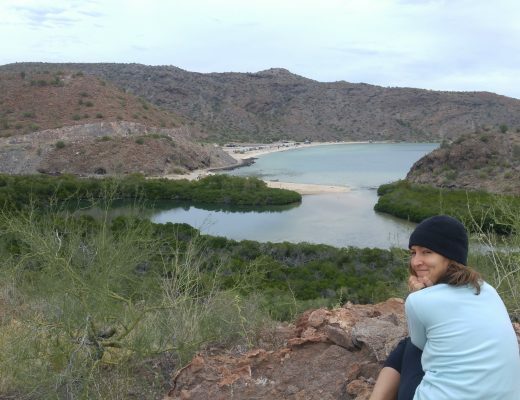 It was not until my sophomore year in college, when I took an oceanography general education course, that I realized that I could make marine biology into a career. The more I looked into it the more interested I became. I have been fortunate enough to have many amazing mentors in the field including Doctor Gruber from the University of Miami, Serge Dedina from Wildcoast, and Jeff Graham from Scripps. My Ph.D. advisors, Rebecca Lewison and Andy Bohonak, and my National Marine Fisheries Service (NMFS) mentor, John Hyde, have also been inspirational in my growth as a scientist. To become a scientist, one needs passion, creativity, patience, and attention to detail. The ability to be constantly observant and open to collaboration also helps. I also want to highlight the fact that just because one intends to become a scientist, does not mean that other subjects are not important; math, reading comprehension, and written communication are vital in the field. Mako sharks are long-lived species that are vulnerable to commercial and recreational fisheries. In order to ensure that the species and the fisheries for the species are sustainable into the future, we need to understand the dynamics of mako populations. My research looks into how populations of mako across the Pacific are connected, which helps develop effective management for the species. I will bring some shark genetics samples, some pipettors for people to try (along with some other lab equipment), some photos and a computer with a presentation explaining the work. The best advice I have is that perseverance and hard work pay off. In order to make it in this field, you have to be passionate. For students, I recommend paying attention in math and computer classes, they are becoming more important in our analyses. Also, get lots of practice writing essays because communication is the key to success. I love all ocean creatures big and small, but I am partial to mako and thresher sharks as they are my primary study species. 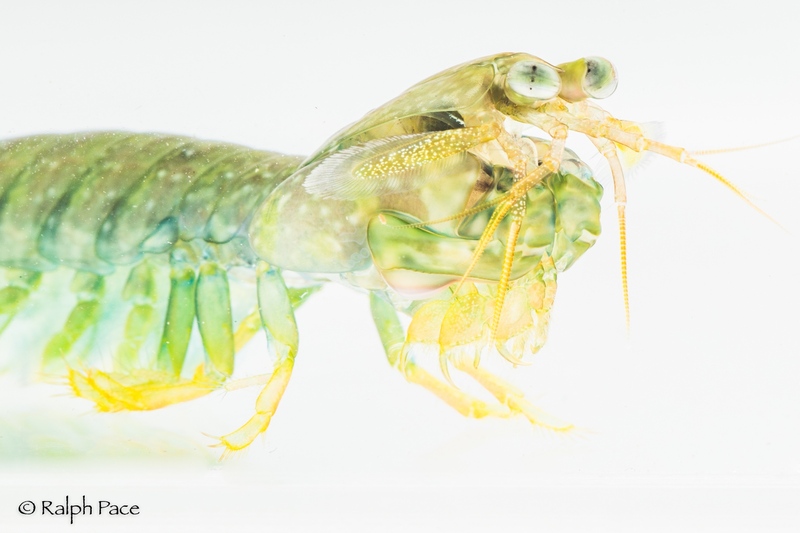 As an ecologist I like to think about ecosystem processes and the relationships among species as opposed to just focusing on one favorite organism. 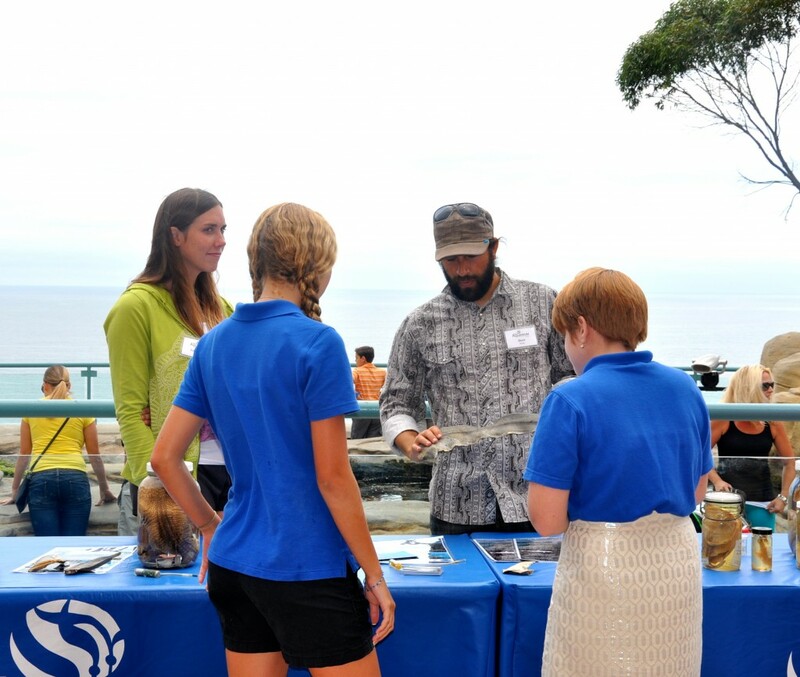 Join us on Saturday, August 16th for SEA Days: Sharks On The Line—there’s something for everyone! Do you ever study the pelagic sharks that move northward during El Nino episodes? From what I have read species such as Hammerheads,Tigers,Dusky & Bronze Whalers & others (Black-tip & Narrowtooth) move into the Bite. One question I have is that years ago it was reported that large “Bay Sharks were common in San Diego Bay. The specific species was never finalized between the Dusky, Bronze Whaler, or Blacktip. Most believe it was the Whaler. Can you share any info you might have about this? Another question is, where did they go? They seemingly left the Bay entirely. Did it have to do with water conditions or increase in activity w/I the SD Bay?